The year has been a year of transition for the library. With the full implementation of the online catalog through the LibSys.net software the card catalog is no longer in use. No new records are added to it. 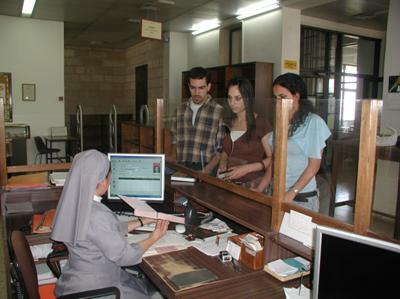 Circulation is managed by recording the transaction in the circulation unit using the university ID with a barcode. Signing the traditional book card is discontinued. Everyone can access the online catalog and a personal account for current information from any computer. The staff of the library is involved in new processes to enter data in cataloging, acquisitions, and administering the new system. Hundreds of hours were used in placing barcode labels on all the books in the collection. Searching the electronic journals databases for current periodical resources has replaced the use of the Readers’ Guide and other periodical indexes. Full text electronic journals have replaced many printed versions in our collection. For the first time in our history an external reviewer visited our library for a comprehensive study of the operation and to offer recommendations for continuous improvement. Information on these and other ongoing developments is contained in these pages. For the past few years the library has been involved in a major project to improve library resources in all Palestinian universities. The Academy for Educational Development (AED) – Higher Education Support Initiative (HESI) in cooperation the Ministry of Education and Higher Education (MOEHE) and the Committee of Academic Libraries is managing the development of the project. 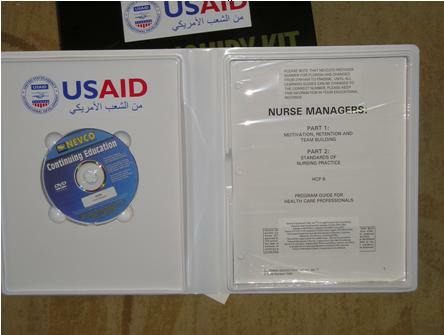 USAID is funding the project. The first phase, a one year subscription to EBSCOhost Academic Search Premier, has been completed. This electronic journals database continues to be available as one of our online databases. The second phase provided five computer work stations to be used solely by students to access electronic journals databases, the online library catalog, and other library resources. They are placed on the first and second floors. For the third phase the grant provided $45,000 for the purchase of books and non-print resources. At this time 500 books in Arabic and 60 DVDs have arrived. They will be available for use after they are cataloged. Due to the generosity of the Italian Catholic Bishops Conference and the government of Finland, Bethlehem University now has a fully functioning videoconferencing facility in L-002. The new facility can connect with most other videoconferencing facilities throughout Palestine and the world. It is under the supervision of the AV Center staff. Ms. Hala Marzouka, Head of Arabic Technical Services and Mr. George Awwad, Reference Librarian participated in a week-long course based on the theme of the Library of Congress Classification System. The course was offered as one in the Library Workshop Series at Birzeit University. Mr. William Kopycki, expert in the field from the University of Pennsylvania, introduced the latest advances in classification and demonstrated the use of electronic versions of classification schedules. Mr. George Awwad, Reference Librarian and Mr. Francis Sleibi, Head of the Audio Visual Center attended a two-day workshop in Ramallah organized by the British Council in conjunction with eIFL (Electronic Information for Libraries). The aim is to build a national library consortium capable of sustained activities in the development of electronic libraries and the provision of electronic services to users. Mr. George Maria, Assistant in the AV Center, presented a short training course to the Public Relations staff in the preparation of the university homepage (www.bethlehem.edu). The PR staff now has the skills needed to maintain the website with updated information.